Whilst compiling this list of the best Fly London Boots to buy this season we have based our list on a number of factors. The bulk of this comes from the average review rating for the product found on the biggest online stores selling them. If there is a fitting issue or a durability problem then those will be rated more lowly and not appear on the list. We have then added styles which have special properties that you may not be aware of like a warm lining or a waterproof interlining. The brand produces around 300 styles options per season. Many of the boots on the list are indeed available in a number of colour and material options. There may well be a photo of a leather boot but the style might also be available in suede or nubuck. In this case, we have provided a photograph of the best selling version and the best selling colour. Make your own mind up! 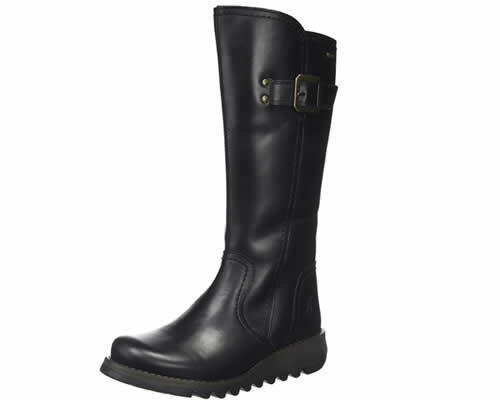 Coming in at number ten on our list in Shap which is a calf length leather biker style boot with a smart buckle near the top. One of the most frequently asked questions we get is whether the brand’s boots let in water so we are over the moon to find that Fly have actually responded to these requests and made a boot that really doesn’t. For us, this is a major step forward. So what makes Shap such a great boot? 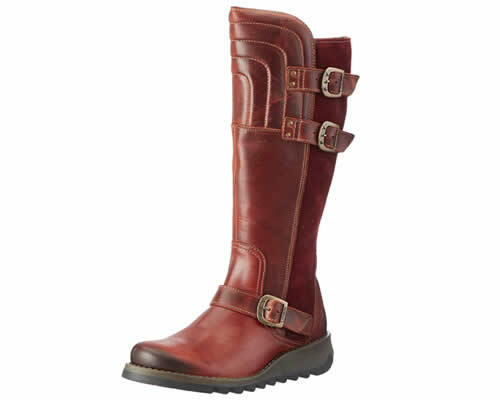 It’s made from high-grade rug leather that features on most of the best selling boots. This is their best selling material and is made from cow skin that has been impregnated with a natural oil to give it that waxy feel. The material has a natural water resistant but it is the addition of a Gore-Tex lining that makes the boot impervious to water. Whilst we would not expect you to actually go around jumping in puddles, the boot will keep your feet dry in the rain and snow with reasonable use. Clearly, if you go and stand in a river then the water will go over the top or in through the zip. It’s for this reason that you should still regard this as a fashion item. New for this season is this really smart below the knee boot called Sher. Made from sumptuous leather with a synthetic, well actually it’s microfibre so it is nice and soft and very comfortable on the leg. 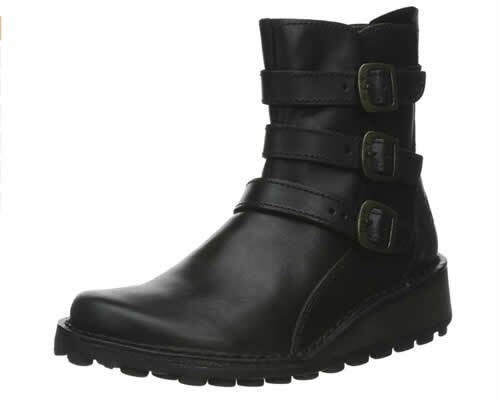 The boot is an updated version of Mes with a padded, biker style top with twin buckles at the top and a buckle passing over the instep. This really is a great looking boot and the antique buckles really set it off. If you are not a fan of the brick red colour then there are many other colours to choose from as we set out below. If you look at the image above you will see that the toe is a darker colour than the rest of the boot. This is down to leather burnishing which is a way of giving the surface an antique look. When the construction of the boot is finished the worker holds it against a rotating mop which has had wax applied to it. When the leather touches the mop it heats up and the surface of the leather gets hot and begins to ‘burnish’. This is all done by hand and is quite labour intensive, so it is not a cheap process. A similar effect can be achieved by hand as in this video here. This shows how the worker applies wax and then creates friction by rubbing the surface of the leather very briskly. The back of these boots is accentuated with a suede panel which closely matches the leather colour. There is also a zip running down the inside which in this photo you can’t see but makes them easy to get and off. Fly has a great tradition in making amazing ankle boots and Myso is no exception. It is made on one of the brands oldest constructions which has always been used to make the more traditional styles like Mes. We have mentioned this iconic boot before and the way that it is made. It is a switch down which is the same way that a more familiar desert boot is made. the upper is stitched to a midsole and this is actually cemented to the outsole which in this case is the familiar rubber used in all of their collections. You can see the evidence of the stitches rows running around the rand, which is the extended area at the edge of the sole. This take on a sturdy ankle boot comes with three buckles running down the leg. It would be easy to think that you would have to undo them all to get them on but this is not the case. There is an inside zip running up the inside so the boot is really easy just to slip on and off. The soft round toe and chunky heel add to the classic Fly effect. Looking great with black skinny jeams or just with a skirt – proper rock ‘n roll! Of all the boots that Fly produce Seti must be one of the most iconic. Its origins once again rest in the biker styles of old which were on the stitch down unit sole. This is an updated version with a more sturdy cemented sole which you can also see on Sher above. Once again it is made from their most iconic rug leather which has been burnished on some version as you can see in the photograph below. Such a classic looking Fly ankle boot, biker in style with the addition of the two antique brass buckles, one across the lower part of the leg ad the other across the instep. 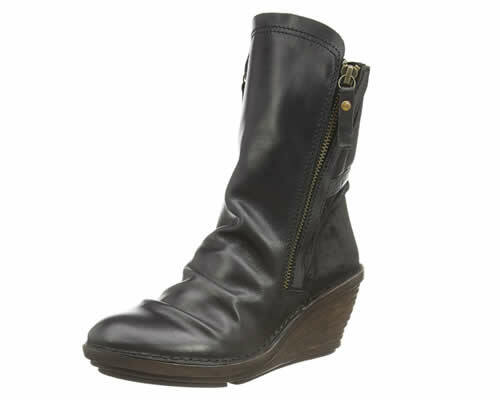 The burnish effect is on teh toe and on the back of the heel and the boot has self-stitching all over. I also sits on the same two colour rubber sole as the higher versions above. In terms of look, fit and style you can’t really go wrong with this boot. It can be worn any number of ways but is such a classic style it has become almost as iconic and ubiquitous as the Ugg. There is a very similar version called Sven which has padding on the front at the top. There is another version called Seku which has a warm wool lining and a Gore-Tex inter-lining – surely the best Fly London boot for the snowy weather when you need to keep your feet warm and dry! We absolutely love this boot because it is so different from the norm. With the multi eyelets running up the front it reminds me of an old style boxer boots. Ster sits on the same sole unit as Seti and benefits from the same type of rug leather with its associated burnished effect on the toe and heel. Just note that on the all black version they don’t do this because you wouldn’t be able to see any difference in the colour! There is also a lower version of this boot called Same which the photo links to. You can choose whether you want a to buy the higher version or the shorter one at a slightly better price. There is also a glimpse of the old style Monkey boots that used to be so prevalent in the 1970s in this style. Just look at how rich the tow looks with that burnishing, looks so cool. As we move up the leg the eyelets, four on each side, are replaced by ski hooks. If you ever went skating, they are a similar arrangement where the lace is simply tucked under them on either side. The rugged rubber outsole gives stability and traction in the toughest conditions. The padded collar at the top provides a little comfort too. I suppose you could argue that lacing the boot up is a bit of a faff, but that is more than made up for by the great looks. 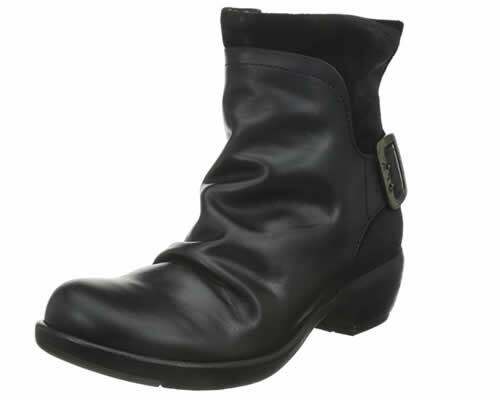 So we are now entering the top 5 and first up is another classic Fly London ankle boot in the shape of Yama. Sitting squarely at the forefront of the brand’s collection the has become something of a design classic. Enhanced by ruching down the front, this boot feels as good as it looks. Supersoft, sumptuous touch leather is crumpled up with a shorshortering to give the multi-layered effect. This results in a clean line with the ruched forepart adding a touch of elegance and class. With it being one of the most popular fly ankle boots there are a lot of variations. delicate suede versions in ruched cow suede augment the Yama collection. The style itself sits on a lightweight 43 mm wedge which is made from thermoplastic rubber. If it was made from gum rubber it would just be too heavy. Constructed using the ‘Californian’ technique, the boot is stitched inside out and then turned. This then creates the smooth rand that you can see running all around. Further enhanced by a back-lace, the boot can be tightened up somewhat which allows for some adjustability. There is also a small collection of leather/suede versions with black suede mixed with anthracite and Choc with Bronze whcih are pretty amazing! Similar in style and appearance to the one above Yegi comes mostly in suede with a ruched front. We like this more because of the smart velcro panel which wraps itself around the back of the ankle. Looking really smart in the photo below which is Diesel suede. Yegi also comes in the supersoft touch leather that is used on Yama and pretty much comes in the same colours both in suede and in leather. Remarkable once more for its clever stitch and turn method of production we love how lightweight and versatile it is. Why is this boot so cool? because it just looks amazing – clean lines and a comfortable yet stylish look. A bit of a curve ball this but Fly customers love this boot! 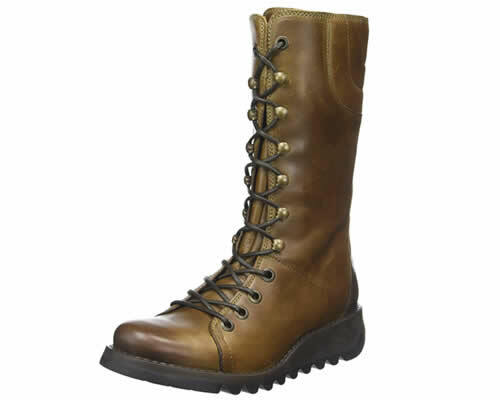 it has a narrower toe and is on a different construction from any of the other boots on this page. Still made from the classic Fly materials as the other – Rug leather and microfibre linings. 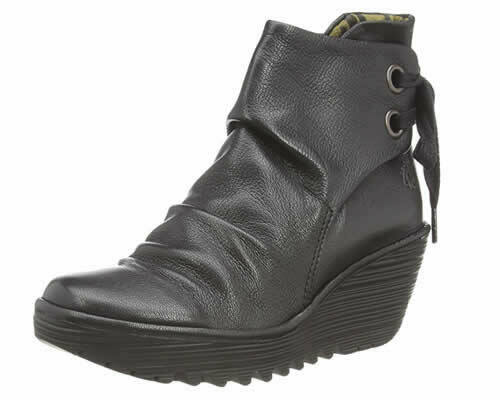 With a twin zip arrangement and lightweight wedge, this boot is elegant and stylish. Obviously, with Fly, you can get an industrial look. Especially with some of the biker and work style boots. Vive La difference with this ruched high ankle boot! Like the other stitch downs on this page, the upper is stitched to a midsole. The midsole is then cemented to the sole with an extremely strong glue. Higher than most of the other styles Simi can be more expensive depending on where you look. 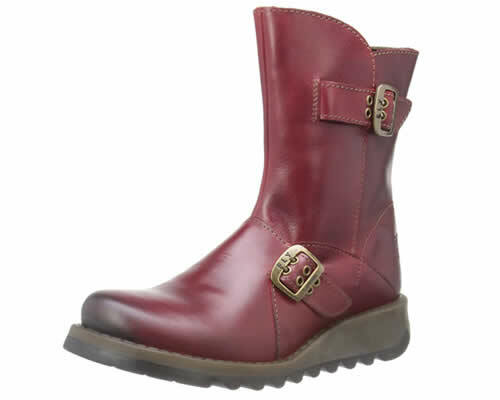 We have however pointed you to the best online prices for Fly London boots in every case on this page. You will sometimes see this referred to as a ‘slouch boot which is another way to describe the ruching down the front. 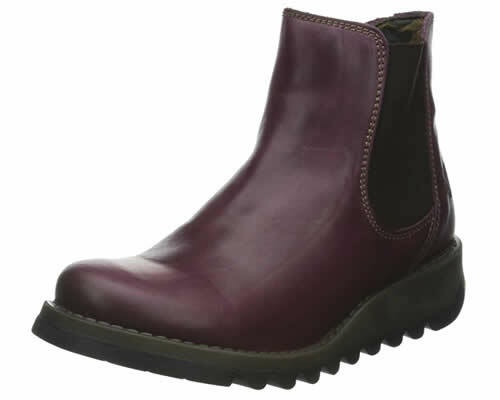 This perennial Fly ankle boot is always at the top of the best selling and best-loved boots from the brand. Sitting on yet another different sole, this time with covered blocky heel and real rubber forepart. This amazing boot continues to dominate the top of the Fly London charts! We have shown you the black leather/black suede version here but really there is a myriad of different colours. These boots have a nifty inside zip so it’s easy to put on and take off and the back part is made from oiled suede, which is not as yucky as it sounds! The chunky block heel gives weight and stability as does the rubber forepart which provides grip and firmness underfoot. Granted it is not as elegant as some of the other boots on this page but it is classic Fly and sits at the core of their collection. It’s tough and gutsy with the rug leather ruching being different on every pair you will see. There is a zip version called Meli so we have provided the link to show all of them. There is also a version with the forepart in sludge suede and the back part, leather. In an era when Chelsea Boots dominate, the best selling boot and the best-loved Fly boot is Salv. Why? well just take a look at those super smooth clean lines and classic good looks. There is nothing to turn anyone off this fabulous boot. It’s got the Fly handwriting in terms of sitting at the very core of their collection. It sits on the best selling sole unit which you see all over this page. You only need to look at the vast collection of colours on the page (click photo) to see just how many versions there are. We don’t really need to tell you the detail as it shares many of the design traits with other boots on this page. The sole unit is hard wearing and durable being made from of thermoplastic rubber. Side elastics are tough, not some thin imitation but sourced locally in Portugal and of high quality. It looks good, it wears well and it’s classic Fly! Leather Colours: Black, Brisk, Brown, Red, Petrol, Olive, Petrol, Dark Brown, Camel, Green, Purple & Blue. With classic good looks and attention to detail Fly London has become a modern classic brand. In twenty years they have transformed themselves into the footwear of choice for a large chunk of the Brtish population! Long may it continue! We hope you have found this page of use! We have presented the top 10 Fly Boots so that you don’t have to trawl through 100s of pages to find what you want so we hope we have found the best ones for you. Read more about the Fly London brand here.